This string quintet, written in 1834, is the fourth of seven by Spohr, who also wrote 36 string quartets, four double quartets for two string quartets, and an assortment of other quartets, duos, trios, sextets, an octet and a nonet. 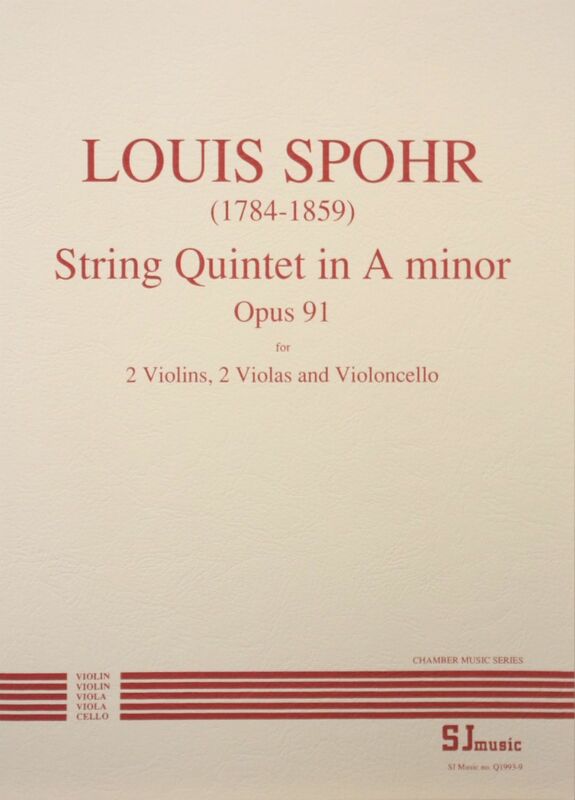 It is rewarding to play, with a first violin part that is more difficult than the other parts – possibly because Spohr was a virtuoso violinist himself. Louis (born Ludwig) Spohr was born in 1784 in Braunschweig in the duchy of Brunswick-Wolfenbüttel and died in 1859 in Kassel, Germany. His first musical encouragement came from his parents: his mother was a gifted singer and pianist, and his father played the flute. A violinist named Dufour gave him his earliest violin teaching. Dufour, recognizing the boy's musical talent, persuaded his parents to send him to Brunswick for further instruction. Duke Karl Wilhelm Ferdinand of Brunswick supported him financially after hearing him play the violin when he was just 15 years old, and he subsequently became well known for both his playing and his compositions throughout Europe. In 1808, he practised with Beethoven at the latter's home, working on the Piano Trio, Op. 70 No. 1, The Ghost, and a few years later, in 1820, he invented the violin chinrest.